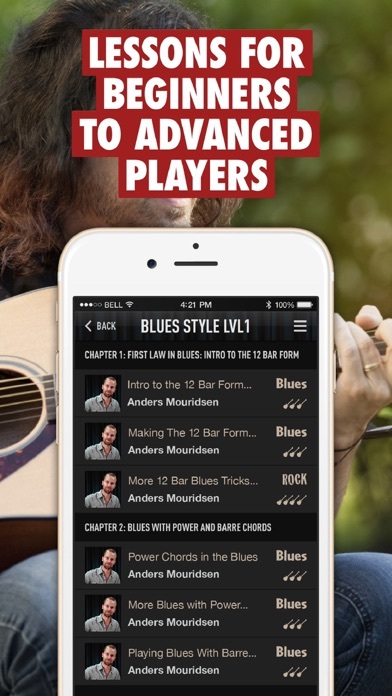 Guitar Tricks is designed to empower beginners to play guitar by learning actual hit songs from the very start – not boring drills and exercises. Learn to play guitar from top instructors who guide you through every step with shorter, incremental videos to increase skill rapidly. 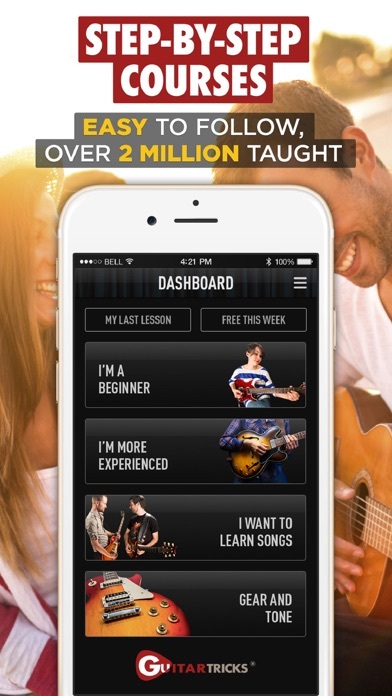 In a recent survey, members reported learning 50-100% FASTER than with other guitar apps! 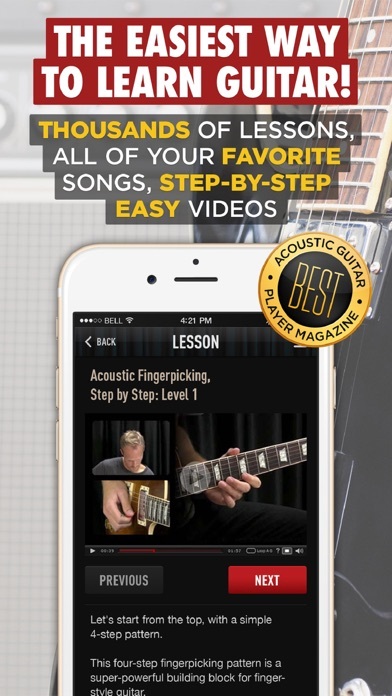 * Award-Winning: Best Online Guitar Resource and Instructional Material * High Quality Step-by-Step Video Guitar lessons * Over 3 Million Members since 1998 Core Learning System – Perfect for beginners The Core Learning System guides beginner guitarists through a series of short videos that focus on you making music from day one. After you nail the basics, the guided videos branch out so you can learn different styles of guitar like Rock, Country, Blues, and more. I’m an intermediate guitar player trying to catch up on theory. The content is great, however, the app is laggy and crashes a lot. Honestly, I get a better experience from the browser. There is so much potential to the app but it’s just not there. Some people have complained that the instructors spend a long time on theory and much less on teaching how to play the actual material. While some of the explanations are much longer than is necessary for me this may be good for others or less experienced players. Their instructional method is geared more to learning all aspects of the instrument and how music theory applies to the guitar in general. I also find that the more recent videos and content suffer less from lack of explanation. Having the notation available for each video is immensely useful especially if you’re someone who tends to learn from videos on YouTube for example. I have my subscription via my gmail, and I haven’t created the guitartricks account. The app doesn’t allow me to login with gmail. I can only access this via the browser. Please fix this. Really enjoying this app but crashes and restarts videos and the worst of all it won’t let me rewind or pause the video, so I’m stuck trying to figure out a song while the video is almost over causing me to restart the 10 min video for just a minute or two of material. So far so good. I’m liking it so far. App needs ability to speed up / down the video, and to loop if posible, like online. Some of it is way too fast / slow and some parts need multiple reps to get it right. Overall not bad though, just a little basic. I think the course is the best online by far. The course is laid out logically and thoroughly so anyone can learn guitar at his or her own pace. The lessons are complete and precise so that every detail of playing is carefully and thoroughly explained. I have never been more satisfied with any online course of any learning whatsoever! 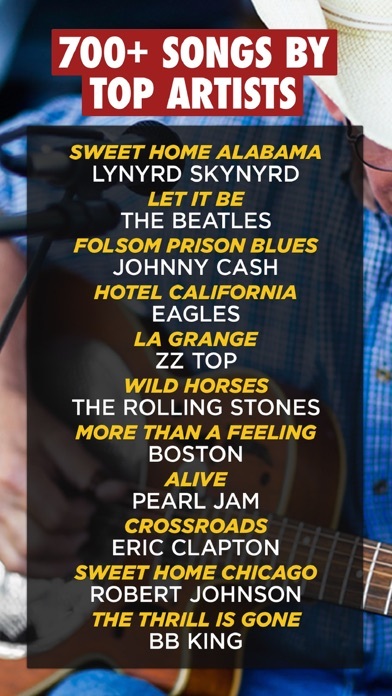 Feb 1st, 2019 Guitar Tricks pulled the rug out from their loyal paying customers by eliminating their Full Access Plus service. It offered 6 hours a week (3 sessions two hours each) for $39 a month flat fee, taught by the fantastic instructors they feature in their video tutorials. I made more progress in a year than the previous ten on my own, but can’t help feeling sour that they pulled the plug ending the best thing they had going for them. Fortunately for me a competitor now offers live webcam sessions plus Live Studio courses. Sorry — had to get that off my chest. This review is intended for feedback on the app, not the service. While the website is feature-packed and great, the iOS apps seem to be mere afterthoughts, simply repurposing their video library and repackaging assets for mobile. AppleTV and iPad apps have the screen real estate to be something special, but lack so many necessary features, so instead of playing guitar where it’s convenient for the user, you’re forced to play near your computer (which might have been fine in 1998 when they started, but severely dated two decades later). 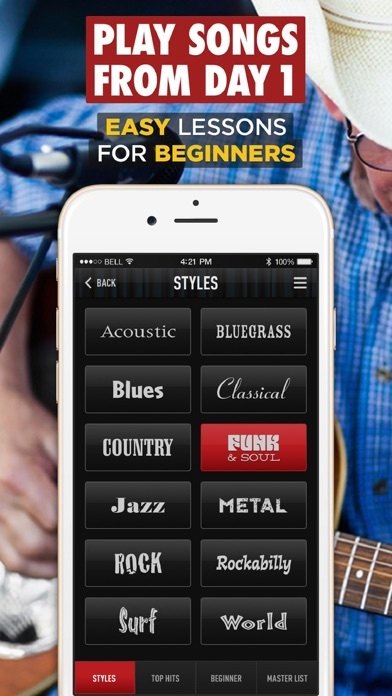 3 biggest oversights using Guitar Tricks app GT boasts a library approaching 1,000 songs (! ), yet AppleTV / iPad has NO SONG SEARCH. 3 years ago they added _SORT_ by Popularity, Alphabetical title, Difficulty, alpha Artist, Style, Newest, and Instructor, but no search Artist nor Song. Scroll scroll scroll for days before giving up. On-screen Tablature is NOT resizeable, tiny text requires you take your hands off guitar and screenshot so you can zoom, before you exit back to the lesson. Incredibly Inefficient. Jam Tracks and Backing Tracks are on the site, but NOT in iOS. Most users hit up JamPlay or YouTube to satisfy their needs. Minor quibble, they do have a scrub bar to slow-down videos so you may play along with the instructor, but it does not list if it’s 50%, 75%, or 90% like the website, leading to random tempos from eyeballing it. I feel iOS apps are not a priority there, paying customers receive maybe a feature update or two annually, plus bug fixes, but GT developers continue to fall behind the competition, failing to innovate. It’s my wish they would let another dev firm prototype an app to management, and design a true iOS app designed from the ground up for mobile, using the same excellent video lessons into something more usable. If you don’t mind playing guitar by your computer, the service offers considerable value. After retiring, I started learning guitar with GuitarTricks. After close to a year, I am now starting fundamentals 2, and feel confident I can play many songs out of various song books. Maybe my rhythm and strumming isn’t perfect, but people can follow along and sing! I am going to continue with this program, excited that fundamentals 2 will expand the entire fretboard. Thank you, I recommend this app. More by Guitar Tricks Inc.